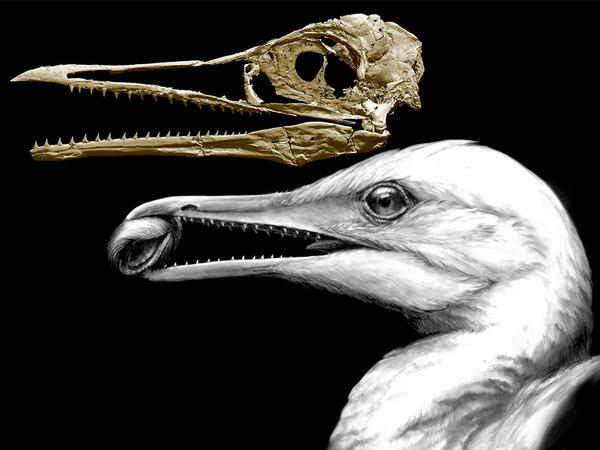 Scientists are one step closer to understanding how modern birds evolved to have beaks. NPR's Rebecca Hersher reports on a new study that goes back millions of years to a birdlike dinosaur from Kansas. REBECCA HERSHER, BYLINE: Birds are direct descendants of dinosaurs, but researchers still don't know exactly how we got from a velociraptor to a seagull. Bhart-Anjan Bhullar is a paleontologist at Yale who's focused on one crucial part of that evolution - the head. BHART-ANJAN BHULLAR: The first thing I think one would notice is that birds have a beak. The other thing they have is an enormously enlarged brain. HERSHER: Dinosaurs don't have any of that. BHULLAR: It's a big step between a tooth, snout and a beak. The heads of dinosaurs like velociraptor - the jaws were filled with large teeth, and they had large jaw muscles and a powerful bite. HERSHER: To figure out how snouts turned into beaks and the little dino brains grew into big bird brains, Bhullar studies the ancient creatures that were evolutionarily halfway between velociraptors and birds. One of them is a creature that lived in Kansas about a hundred million years ago called Ichthyornis. Ichthyornis looks like a really aggressive seagull, like a perfect mash-up between a bird and a dinosaur. BHULLAR: It sits at a really pivotal kind of position in the evolution of birds. HERSHER: It had a beak with teeth in it. But the overall shape of Ichthyornis' skull was less clear because the fossils available were from the 1870s and weren't that complete, which is why Bhullar was really excited in 2014 when he got his hands on a newly discovered Ichthyornis fossil embedded in a slab of rock. He did a CT scan of the whole rock and ended up with a high-resolution 3D image. Two things jumped out about what he saw in the new fossil. First, the bone configuration would have allowed the animal to pinch with its beak the way parrots and other birds grasp nets very carefully. It's the earliest example of that pinching ability, and it appears to support a very cool idea. BHULLAR: Perhaps the bird beak is basically a surrogate hand. HERSHER: Think of it this way. As the claws of velociraptors evolved into the wings of birds, their faces compensated by gaining dexterity. The team also found Ichthyornis's brain was large like a modern bird. But surprisingly, the jaw was muscular like a dinosaur. Until now, scientists had assumed that no animal would have both of those things. BHULLAR: Ichthyornis fills in an important gap. But of course everything that fills in a gap makes two more gaps on either side. HERSHER: The search is on, he says, for more dino-bird fossils. Rebecca Hersher, NPR News. Transcript provided by NPR, Copyright NPR.